Sun Start Chimney Pipe for charging Copper Crickets without a vacuum pump. For many years we theorized starting Copper Crickets using only the heat from the sun. We never really got it to work, and certainly never recommended purely sun starts to our customers or installers. I’ve been working on my own double Copper Cricket system, and was having a hard time evacuating it with a hand pump because I have ‘trigger fingers’, two on each hand that make using the hand pump painful. Yesterday I thought of a better way. My system was over heating because it had air in it. I went up on the roof and carefully attached the actuator valve, evacuated the line, closed the ball valve between the hand pump and the collector to protect it from heat, and opened the actuator. Sure enough, there was over 20 psi of positive pressure. That means the system was over 230F. I took a male 1/8″ SAE fitting and silver brazed it to the end of a 4′ piece of 1/2″ copper pipe. I was in a bit of a hurry and burned a hole through the brass fitting, so I had to fix it with more silver braze. It ended up being quite ugly. 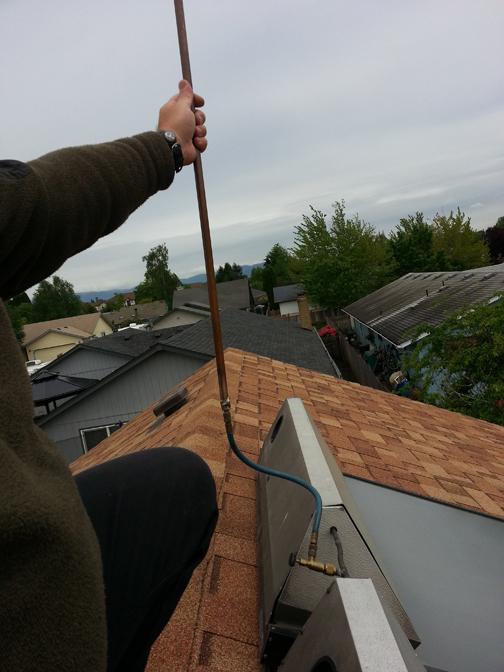 I took this to the roof with a short refrigeration hose and attached it directly to the actuator valve. I put on a pair of leather gloves, and holding the pipe vertically, I opened the actuator valve. The steam flowed out of the pipe, and any liquid that bubbled out, just stayed in the pipe and flowed back down. It took just a few minutes for the system to return to atmospheric pressure. The long pipe condensed a lot of the steam, returning the condensate to the collector. I’m sure I didn’t lose more than a few ounces of liquid. I closed the actuator and sealed it with the cap. The Delta-T of my system was better than ever before, and I was able to charge the system in full sunlight in a matter of minutes. I’m going to experiment with different larger diameter pipe and different conditions, but this really seems to work well. I have a few local Crickets that need burping. I’m going to open them up and let some air in. Let them overheat and gain pressure, then attach my charging chimney and let them drive out the air. We’ll see if that does the trick. This entry was posted in Cricket Tips by Bob. Bookmark the permalink. Looking closley at your pic, I see you are connecting the actuator to a pipe coming from the side of the panel hood. Is this a retrofit you did ?, or is it something from the factory that came later then my version?